"Of course it's supposed to be a sport of 'no contact'. 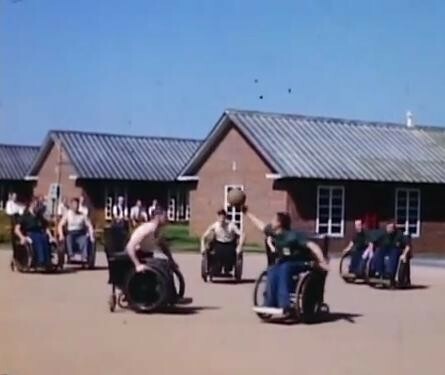 Well that always amuses us all because there's a lot goes on, goes on 'off the ball'... 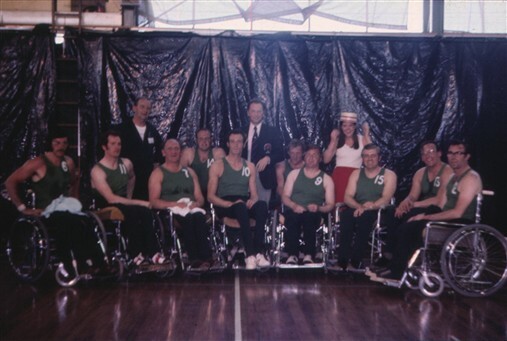 But it has to be very subtle nowadays, where in my day you could actually decide if someone was roughing you up, you could return the compliment and rough them up, and it sometimes got quite physical..."
The 1984 GB team at Stoke Mandeville; Philip Craven was the captain and Martin McElhatton played. 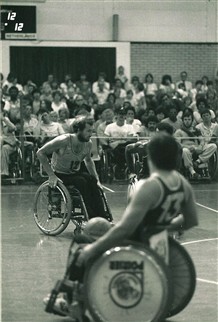 "Then our club went into the first division which was the National League, so we were travelling all over the country; we'd go up to Scotland for the weekend to play matches, or up to the North West - all over the place- but each year the big competition was the National Games here at Stoke Mandeville."